Did you know the cupcakes fromTonnie’s Minislocated at 264 Lenox Avenue are now available atBloomingdales? I learned this from thistelevision report. That’s wonderful news for Tonnie and his fans. Fans and newcomers have two options to purchase cupcake treats. At Bloomies, you can get a California size cupcake or a mini, but if you can’t get to that gigantic department store for a delicious bite of aTonnie’s Minis cupcake, don’t fret. The other options is to go to the boutique store in Harlem located at 123rd Street and Lenox Avenue. If you want a pequeno size or two, go with the mini! 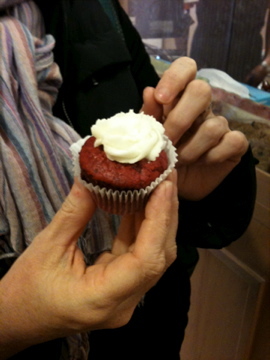 Of course, when my friend and I went to Tonnie’s, out of all the cupcakes we could have purchased, we went with the red velvet mini cupcake. Yum! Why break with tradition…right? 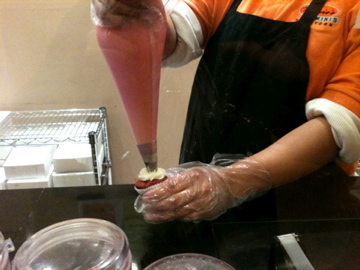 Eating red velvet anything (cake or cupcake) is a natural tendency when you live in Harlem. Want to partake in this tendency? Head on over to Tonnie’s Minis by foot or on the 2/3 subway line! You will enjoy the cupcakeexperience as well as a nice and spacious walk along Lenox Avenue!